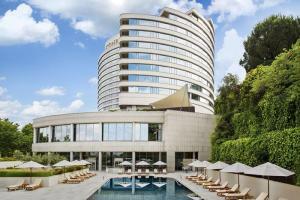 Located in the center of Istanbul, the Conrad Istanbul Bosphorus is built in a unique S-shape that allows all rooms to showcase a magnificent view of the scenic Bosphorus waterway. Each luxury room is fitted with a range of modern amenities, including WiFi and satellite TV. This Istanbul hotel boasts three clay tennis courts, two swimming pools, a fully equipped gym, and a separate swimming pool for children. Dine in one of four restaurants and luxury patisseries. Socialize with friends in the amazing Summit Bar and admire the stunning view of the Bosphorus waterway and Istanbul skyline. Located in the Besiktas area of Istanbul, situated close to tram links leading to the picturesque Old Town and 50 minutes from Ataturk International Airport.